The Split plane fragment option allows a user to divide the mesh using one or more planes. These planes can also generate a variety of noise patterns, where the split(s) occur, creating a more natural surface effect that is similar to when something like a brick is broken into multiple pieces. Allows for the mesh to be dynamically regenerated when the planes are translated. Each plane is its own node that is selectable in either the viewport or the outliner. When it is selected it can be freely transformed. While transforming the mesh will dynamically update if the Live update option is on. If toggled off then the mesh will not change until this option is toggled back on. This is useful when dealing with a large number of planes as transforming a split plane will result in sluggish performance. The size of one cell in a grid. The higher the percentage is will result in less resolution in the split. However, when dealing with large amounts of splits in may be preferred to keep this number high until you have satisfactory simulation results and are ready to start creating final takes. This is the number of planes dividing up the fractured mesh. By default there is only 1 plane but multiple planes may be added. Each plane is represented by its own node. The attributes found within the Splits group allow a user to create more planes and randomly seed their positions. The seed values work the same as voronoi and allow a user to experiment with various combinations and return to any previously used seed value to get the same result as before. The planes are not fixed and can easily be translated. To reset the translations simply press the "Randomize" button again and the planes will be restored to their original positions. This is the number of planes to randomize. By default FractureFX creates one evenly positioned plane when changing the fragments to split_plane. To start experimenting with multiple planes and seeds press the "Randomize" to trigger an update in the viewport. The internally generated noise can be modified. 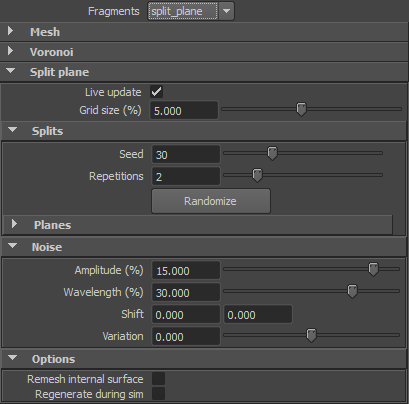 This change will affect all planes belonging to the same fxBreakGeometry node as there are no plane specific noise settings. The height of the displacement is controlled here. Lower values will seemingly flatten out the displacement effect while higher values will give a more dramatic effect. Modifying this attribute can stretch or compress the wave pattern of the noise. Below, smaller values are creating more "spikes" in the mesh while larger values results in a more gradual effect. A noise pattern can be shifted in X or Y by adjusting these values. Adjusting this value up or down will create variations of the noise combining all the aforementioned attributes. This page was last modified on 6 July 2012, at 04:01.